Again this year we’re trying to truly move you with a video that starts the period of preparation to the event and reminds you that you’re expectedsunday the 24th March 2019 in Piazza Duomo and Piazza Castelloto put on the most colorful and addictive race of the year. We want to tell through images and music Stramilano’s beating heart: all of you, the RUN GENERATION! 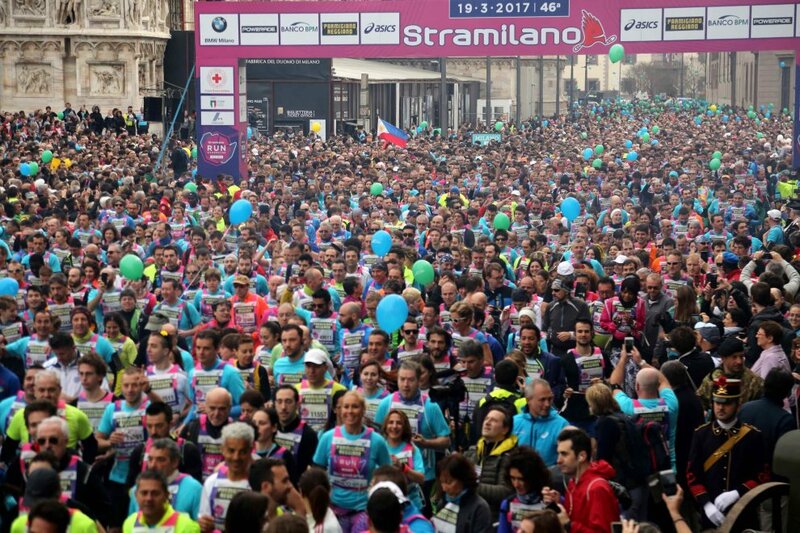 All ages, all genres and all preparations’ levels: Stramilano is everyone’s race, the race for whom love sport and want to live unforgettable moments. Both if you’ve been preparing with months of traning or you just want to walk through Milano’s streets, you’re all a part of the big sportspeople “family” that put on a unique sunday. Like any good competition, you’ll be rewarded with an amazing and shiny medal with which you can take a selfie while you bite it…like the champions do! 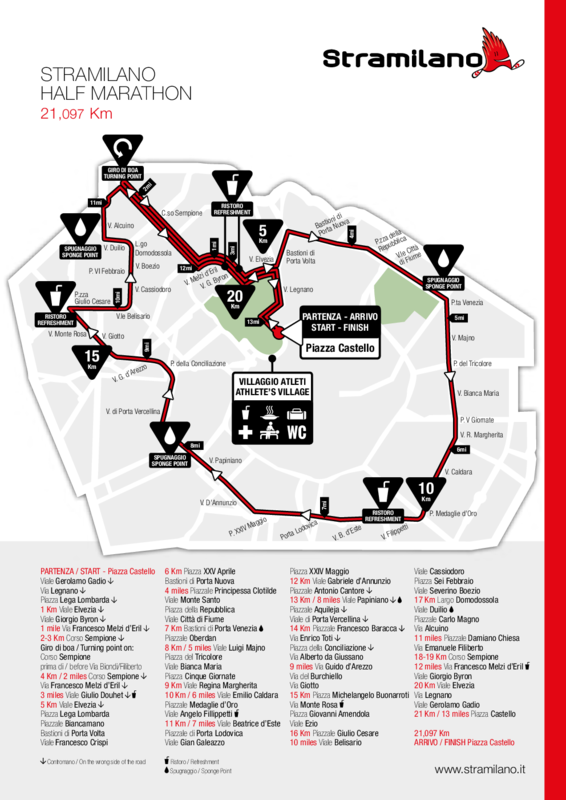 The half marathon that takes place alongside the Stramilano 10 km is a spectacular, internationally renowned race. It was first held in 1976, when it was won by the Colombian athlete Victor Mora. It has always been run over the traditional distance of 21.097 km, except for in 1985. 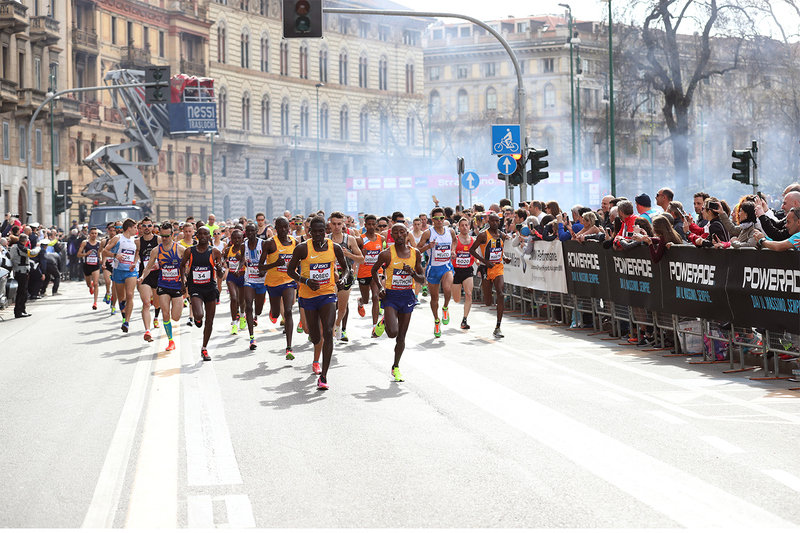 This is the story of the Stramilano Half Marathon and the exceptional athletes that have competed in the race over the years. The first race for top-class athletes was held early one Sunday morning, before the crowds hit the streets for the fun run. The first time to go into the record books was an excellent 1:02:28 by the moustached Colombian of indigenous origins Victor Mora, who beat the prominent Italian athletes Fava and Cindolo. In the following years, the reputation of the race grew and victories were claimed by the Ethiopian Mohammed Kedir (1977), the Italian Franco Fava (1978) and the Chilean Edmundo Warnke (1979). Between 1990 and 1993, Moses Tanui was the undisputed king of the Stramilano. He broke the course record twice, setting times of 1:00:51 in 1991 and 59:47 in 1993. The latter time was a real milestone in athletics history because he was the first person to break the one-hour barrier for the half marathon. 1993 also saw the first all-Kenyan podium, which was occupied by Tanui, Masai and a very young Paul Tergat. From the following year, Tergat was untouchable in the Stramilano. He enjoyed no fewer than six consecutive victories between 1994 and 1999. The highlight came in 1998, when he set a half marathon world record of 59:17 which went unbeaten for a long time. He had actually already posted an exceptional winning time of 58:51 in 1996, but it was not ratified because the course was found to be 49 metres too short. The Kenyan Patrick Ivuti started off the new millennium with two wins in a row in the Stramilano International Half Marathon (2000 and 2001). This was followed in 2002 by the return of an Italian runner to the top of the podium, in what was the country’s last success to date. Rachid Berradi was the man to bring an end to a Kenyan monopoly that had lasted for no fewer than 13 races. In doing so, he set an Italian half marathon record of 1:00:20. The following year, the Tanzanian John Yuda was the first to cross the line. Next came four wins for the magnificent Kenyans: Robert Kipchumba in 2004, Kenebei W. Kiprotich in 2005, Paul Kimaiyo Kimugul in 2006 and Philemon Kipchumba Kisang in 2007. During this winning streak, the Olympic marathon champion Stefano Baldini claimed an impressive third place in 2006. Philemon Kipchumba Kisang held onto his crown in 2008, while in 2009 there was another all-Kenyan podium, with Paul Kimaiyo Kimugul on the top step. In the women’s race, the Hungarian athlete Aniko Kalovics had a hat trick of wins in 2005, 2006 and 2007. Brazil’s Maria Zeferina Baldaia went on to triumph in 2008, when Ornella Ferrara put in a great performance to come third. In 2009, the Ethiopian Aberu Shewaye won the race and set the current women’s Stramilano record with an outstanding time of 1:08:43. In 2010, another Kenyan trio filled the podium after Moses Cheruiyot Mosop stormed home in a stunning 59:20. Their compatriot Jane Kiptoo Jepkosgei continued the Kenyan dominance by winning the women’s race. In 2011, the Kenyan Mathew Kisorio topped an elite field of the very finest half marathon runners when he crossed the line all by himself in a breathtaking time of 1:00:03. He was followed 17 seconds later by his fellow countryman Eric Ndiema, who won the sprint for second place against the Ethiopian Dereje Hailegiorgis. In the women’s race, the wonderful Italian athlete Anna Incerti was beaten into second place by the Ethiopian Eyeshaneh Ababel, who finished in 1:09:54. The Italian athletes put in a great performance in 2012, when Andrea Lalli did superbly to come second behind the Ethiopian Jacob Yarso Kintra, who crossed the line in 1:01:07. Third place went to the Kenyan Kiprop Limo. It was a great day for Italy in the women’s race as well, as Valeria Straneo came first in 1:08:48, Palermo’s Anna Incerti came second in 1:10:36 and Marcella Mancini claimed third place in 1:15:31, completing an Italian hat trick. The rainy 2013 edition broke a record before the race even began, when an unprecedented number of people entered the half marathon. Having finished third in 2012, the 20-year-old Kenyan Kiprop Limo topped a field of more than 6,000 as he came home in 1:01:49. In his half marathon debut, the Moroccan-born athlete from Lecco Ahmed El Mazoury earned an extraordinary third place (1:03:37) behind Kenya’s highly acclaimed Robert Kwemoi Chemosin. In the women’s race, the Kenyan duo Pauline Njeri Kahenya (1:11:19) and Hellen Jepkurgat (1:11:21) came first and second, ahead of Italy’s Emma Quaglia and Elena Romagnolo in third and fourth place. The 2014 edition is a triumph for African runners: Thomas J. Lokomwa (Kenya) earned the first place, while his compatriot Limo reached the second place and Busienei (Uganda) the third one. Lucy Wambul Murigi (Kenya) won the women’s race, followed by the Ethiopians Konjit Tilahun Biruk and Kumesci Sichala Deressa. In 2015 Lokomwa was one more time the champion of Stramilano Half Marathon, with a better time (1h00’33”). In the women’s race Murigi (third place) was beaten by Kangogo Rebecca Chesire (Kenya), who arrived in 1h08’21”. The 2016 edition came with a great surprise: a new Stramilano record! James Mwanji Wangari reached the finish line in just 59’12”, while Rael Nguriatukei Kiyara (Kenya) won the first place in the women’s race in 1h10’19”. The 2017 came with a new record for women runners: Ruth Chepngetich earned the first place in 1h07’42”. In the men’s race the first place was conquered by the Kenyan Fredrick Moranga (1h01’20”), while the Italian runners, men and women, reached the finish line with a good time: 1h03’43” for Daniele Meucci (seventh place) and 1h12’35” for Anna Incerti (fourth place).